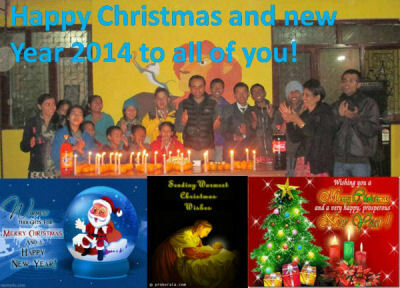 DHC New Life Centre News 2013 and Earlier. Amrit and the Members of the DHC New Life Management Board. The 16th December was a very special day for our organisation. 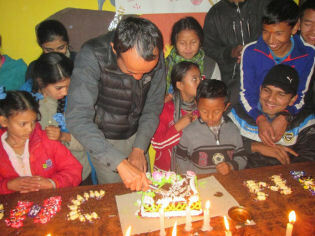 We celebrated or 3rd Birthday with a very happy party for all the children at the Care House and were joined by Bharat, Ajaya, Sarvana, Manoj, Surendra and Saraswoti of our extended family. The four youngest family members: Hira, Pushpa, Chetin and Sunita entertained us with Dancing, and Dhan Bhadur with singing. Your generosity and continued support of this family has made our first three years a wonderful time for all the family and we thank you all so very much, and look forward to another bright year. Our college students, Bharat, Ajaya, Sarvana, Soma and Shanta have recently received the results of their first term examinations and once again we are very proud of their results that have been achieved with many hours of study and hard work. Bharat and Soma came top of his and her class and that is a wonderful achievement. Wonderful News! 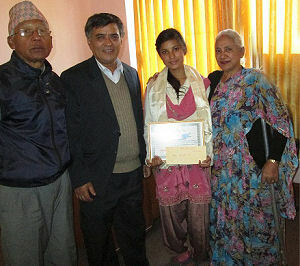 On the 3rd December Sarvana Pandey received the National Disabled Federation of Nepal's award for the highest marks attained by a physically disabled student in the 2013 SLC examinations in all of Nepal. We are all very proud of Sarvana and all the hard work that she puts in to her studies. The award was presented by Prachandra Mhan Bajracharya, also pictured with Sarvana are the Social Workers, Mrs Ganga Poudel and Mr Hem Poudel. Her success follows on from Manoj Khatri winning this award 2 years ago, and Saraswoti Adhikari 3 years ago. We say a big thank you to you all, our donors and supporters for continuing to send your donations and provide the best possible education for all the DHC New Life family. Hira Lal Rokaya visited his relatives home the for Dashin festival, and at that time an overseas orthopaedic specialist was in the area performing surgeries. The Specialist examined Hira Lal and suggested a corrective operation and then fitting orthopaedic shoes. He was able to fit Hira Lalinto his busy schedule and the operation was successful. After 2 weeks hospital rest Hira Lal arrived back at DHC New Life Centre yesterday and we are all so happy that he will now be more mobile and comfortable. Now in Kathmandu we have 10 days Banda (general strike) which makes life really difficult, only Class 10 can go to school, in morning only. Next week we have elections but one of the Maoist political parties refused to participate in the election so they are enforcing a Banda in protest. Manoj Khatri has recently passed the entrance examinations to the Pokhara University's Cist College Banaswor in Khatamandu. Manoj is embarking on a 4 year course of study for the Bachelor of Science in Public Health degree. He has worked very hard at his studies to prepare for the exams and is so very excited about the opportunity to attend University. He said that 6/7 years ago when he was in a government school in Khatamandu with poor quality education, he never imagined he could one day go university , but when got the chance to go an excellent private school his study gradually improved and he passed SLC with excellent marks. Manoj then completed two years further study and his tutors highly recommended that he sit the University Entrance exams. 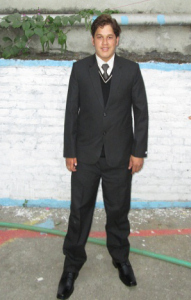 We are very proud of Manoj, and he is the first member of the DHC New Life family to go to University. Manoj in his university uniform. Last Saturday the results of the 2nd term examinations were published. All our students achieved wonderful results, and we are so very proud of them and excited to share this special news with you all because it is your help and support which has given these children the opportunity to achieve these wonderful results. The excellent schooling provided by East-Pole School, the comfortable and happy home facilities at the DHC New Life Care House, and the excellent nutritious diet the family now enjoys, are all made possible by your support and love. Thank you!! 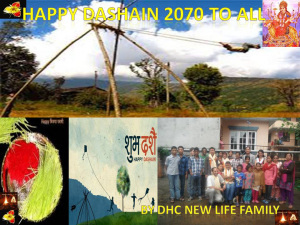 From last Saturday the children have 2 weeks holiday for our greatest festival Dashain. Part of the custom of this festival is for children to get new clothes we have been able to follow this custom and provide the children with a set of new clothes each. You can see in the attached photo, where they are wearing their new clothes, how happy they are to have these clothes! Also at this festival time the children will, where possible, go to visit their family or relatives, which we encourage strongly as it helps the children to remain connected with their family and village and with the culture of their particular part of Nepal. Saturday 29th June 2013 was a day of celebration tinged with some sadness, as we marked the graduation of Bharat, Ajaya, Sarvana, Shanta and Soma, the first of the family to move from the Care House to independent living,as they commence their College education and now graduate to become valued and loved members of our extended family. We had a wonderful day with the DHC New Life Board members and neighbours sharing in the celebrations. Shanta is not in the photos as she was unable to make the journey back from her village.She has enrolled in a local College and we all sent her our love and very best wishes. At this time we also thanks you all for your generous support. Without you there would have been no possibility for these talented and dedicated young adults to be able to continue on with higher education and work towards to fulfilling their dreams for the future. 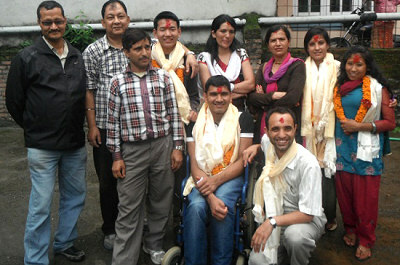 Amrit and members of the DHC New Life Management Board. Today the results of the SLC examinations have been published. SLC is the nationwide examination that students sit at the end of their Class 10 year. Sarvana, Shanta, Soma, Ajaya and Bharat worked extremely hard at their studies all year and also went early to school every day (6 am! ):, to get the benefits of optional extra classes. They have all achieved wonderful results, and we were are so very proud of them and excited to share this special news with you all. Your help and support has given these young people the opportunity to achieve these wonderful results. The excellent schooling provided by East-Pole School, the comfortable and happy home facilities at the DHC New Life Care House, and the excellent nutritious diet the family now enjoys, are all made possible by your support and love. Namaste We Have Some Very Special News. 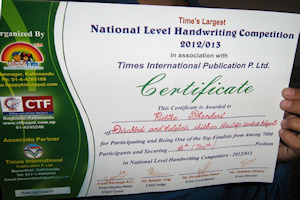 In the newsletter that you received from Rose a few weeks ago you read about Manoj Subedi and Rebika Bhandari making the finals of the National Handwriting Competition for schools in Nepal. 7000 students from 500 schools throughout Nepal entered the competition and 500 went through to the finals. Last week at those finals Manoj achieved 7th and Rebika achieved 10th out of 7000 students across all of Nepal! We are so very proud of them and all the hard work they put in to practicing their handwriting leading up to the finals. A full newsletter will be sent out in a few weeks, but this news is so special that we wanted to share it with you now. Manoj and Rebika with their certificates. Once again I am rapidly coming to the end of my stay here with the DHC New Life Family. The time just flys when I am here, and this year Sue was unable to make the trip from Australia, so Amrit has kept me really busy! Still time to enjoy the family, and frustrate Chetin, one of the new children. He's a very outgoing and determined little guy, and has not previously had anyone in his life that cannot understand his Nepali chatter. When Sue and I are here together we wander all over the city shopping for necessary stuff with the donations that we bring. However, this year, can't work out whether they think it's because they think I've got old and frail, more likely to be that Sue isn't here. There is a posse of teenage boys who are my minders when we go shopping! self appointed!! The big transitions here are the admission of 5 new young children, and the 5 oldest, who have just completed their SLC exams, and are waiting till mid June for the results , will be moving out of the Care House to continue their year 11 and 12 studies, which are called +2 in Nepal . Specially designated Colleges cater for these two years of study. It is simply wonderful to see the benefits all the students here are receiving from the donors generosity. Kumari Gurung arrived in February, she is 11 and from a remote part of the Gorkha district. Her village is two days walk after the end of the road up into the foothills of Mt Manaslu. 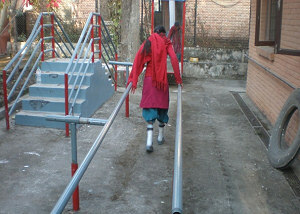 Kumari has had very limited schooling and is starting in class 3 at East-Pole School. Hira La Rokaya is 9 years old and from the remotest part of Nepal, Humla District. He is a wee guy who is learning Nepali as his village speaks a different dialect, so the teenagers are helping him with new words. He is has cerebral palsy and is paralysed down the left side, with a twisted arm and shortened leg, as a result of a severe fever when he was tiny. He has started his schooling at East-Pole School in Upper Kindergarten. He's the size of a 4 year old probably due to malnutrition, and is loving tucking into enormous plates of Rice and veges. When Hira's family brought him to Kathmandu and he saw his first motorbike, he said "Look - big eyes horse" Well if someone is riding it then it must be a horse! Last week we took all the East-Pole school students to buy new school shoes, I don't think that either Hira or Chetin have ever had black shoes , and it is delightful watching them each morning polishing the whole shoe ( including the sole!) Even though Bharat has showed them that is not necessary. Puspa Khadka is 9 years old from very remote Shalan District.Her father deserted the family so they are very poor. When she was 5 yrs old she fell down a steep hill and damaged the base of her spine. It was left untreated and has fused causing vertical hip dysplasia. We took her to the Dr Anil, the Director of the Orthopaedic hospital for xrays and assesment and he has a team of American specialists coming in October and is hopeful that they may be able to help.Puspa has had just one year at school, and is now in Class one at East-Pole School. Tamang is 11yrs old from very remote Dolaka District. Her Father died some years ago and her Mother now has terminal cancer. She has a club foot and scoliosis of the lower spinal region which has fused several vertebrae.Sunita has had limited schooling, and is now in Class 3 at East-Pole school. The American team of Orthopaedic surgeons will hopefully be able to operate on her foot in October. Chetin Dorgey Sherpa is 8 years old from very remote Dolaka. His Mother left when he was 2 years old, Father is alcoholic and the caring was left to Grandfather who is now too old to cope. Chetin has a great appetite. Last night after he had cleaned his plate of food he saw two grains of rice on the table, so they were carefully scooped up and also eaten. All these children are reveling in an environment where food is plentiful and nutritious, and heaps of love abounds. 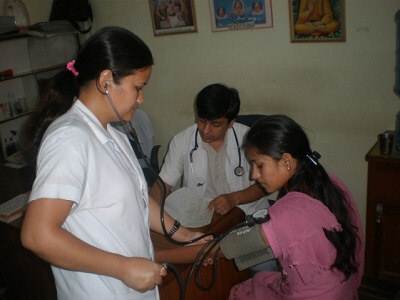 Chetin and Kumari have no physical disabilities, and were selected due to the extreme poverty of their families. As you can imagine, every day calls come in to Amrit asking to take poverty stricken and disabled children, as the need is so great here. The Principal of East-Pole School, Rajesh Rai, who has over 1200 children on his role, complemented Amrit and the DHC New Life Board for choosing to select children from the very remote areas, he said that even the INGO's do not reach out to the Humla district where Hira comes from. 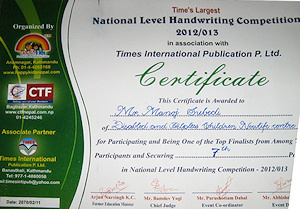 Very Special news about Rebika and Manoj: The National Level Handwriting Competition for Schools in Nepal in association with Times International Publications Ltd 2012/2013 is in progress. Rebika in Class 10 and Manoj in Class 8 won their school's event ( there are 1200 students at East-Pole), then went on to the second round held at Bagmati School, advanced to the third round held at Nightingale School and are now in the finals to be held at Galaxy School on May 25th! This certainly demonstrates just how valued the donors' contributions to the education of the students at DHC New Life Centre are. Neither Rebika nor Manoj had the advantage of starting school when they were 5 years old ,so when given the opportunity of an education they studied very diligently to catch up to their age group. Now at East-Pole School they are right up at the top of their classes. Credit is also due to the excellent teachers and management of the school and the policy of DHC New Life Centre to provide the best possible schooling for our students. We could not do this without you, our wonderful supporters. There is approximately $4000.00 US Dollars outstanding to meet our education budget for all our students for this year. We thank those donors who have already contributed and would greatly appreciate whatever assistance any new donors are able to give, regardless how small the amount may be. See Bank Details Below. 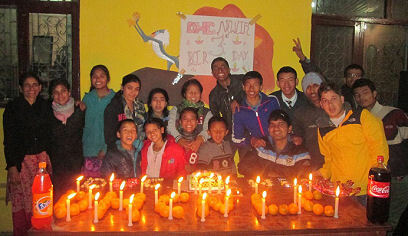 Sunday 14th April was the celebration of Nepali New Year 2070, and as it was school holidays some of the young people were still away visiting their villages, but the family here had a lovely celebration. Bharat made a big Happy New Year Poster wishing all the family and all our donors and supporters the very best for the New Year, and I had brought some sweets from New Zealand, and there were bananas, apples, yoghurt and chocolate bars. All this before Breakfast! It was especially wonderful to see the excitement and enjoyment of the 5 new children, Kumari, Puspa, Sunita, Hira and Chetin who have all come from remote and poor villages. The tailor's visit to measure them for their new school uniforms, was another exciting time,as was the school shoe buying outing. It is wonderful to see the older family members who are all now teenagers, caring and loving the younger ones. 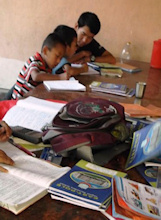 We will be employing a teacher to come in after school to help with homework tuition, however, as Bharat, Ajaya and Sarvana will be here till mid June, they have taken up the after school teaching: Bharat with Puspa and Sunita, Ajaya with Hira and Chetin and Sarvana with Kumari. They happily volunteered and take their tasks seriously.It is excellent seeing the older students giving back to the organization in this way. School is now into the 2nd week and the new 5 are just reveling in their opportunity to study. It is a very long day for the young ones, as the school bus comes at 8.45am and they don't get home till around 5pm. Then they have their afternoon snack, and rush off happily to get their books for study time. It is a delight to see. DHC New Life will be continuing to provide full support for our students who have recently completed SLC and will be moving on to College in a few months time. Bharat will be studying Humanities here in Kathmandu. He will be sharing a rented room with his younger brother, and his family have offered to meet 30% of his overall education and living expenses. This is greatly appreciated as Bharat's older brother Chakra came to DHC New Life with this proposal. 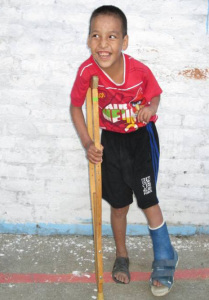 We are providing a spare set of new crutches, two pairs of orthopaedic boots, and a new wheelchair, which will be donated by one of the Charities, and if the need arises for Bharat to have a replacement of his prosthesis within the two years DHC New Life will provide that also. Ajaya will be studying Science, he comes from a very poor family whose condition has worsened, and has no family in Kathmandu so DHC New Life will paying his full living expenses and full education expenses for his two College years and also the three month Bridging Course. Shanta will be studying Commerce in her home village as the College, which has a good educational reputation, is both close and easy flat access from her home. 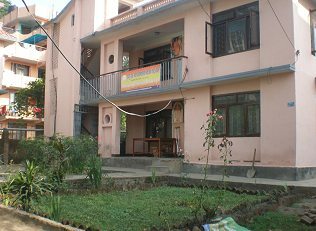 DHC New Life will be paying her education expenses for the two years of College, and her family, whose financial situation has improved in the 5 years that Shanta has been in Kathmandu, will support her living needs. Soma will be studying Commerce in her home village also. We still have some details to receive regarding the College there and as with Shanta DHC New Life will be paying her two years of education expenses. Her Mother is now making a steady income with a small business, and is very happy that Soma will be with her again. In meetings we have had with the families it has been emphasised that the organisation and through us, the donors, require accountability for the money invested in the students education. Three times a year the Colleges have internal exams, and the students will send these results to DHC to be sent on to the donors. On Friday, the second to last day of the School holidays, thanks to a donor, we all went on a mystery picnic. The Picnic was a huge success and definitely a big highlight in these kids lives, and probably also in the lives of the Board Members who came too. It was so good to see these Nepali Businessmen in relaxation mode. We traveled 2 hours up north of Kathmandu to the Sun Khosi Resort on the banks of the Sun Khosi river. The resort bit is still a work in progress by Western standards. Their promo is sun, sand and water. We were so lucky with the weather as it was hot and sunny(was cold and wet for the next three days). They provided an excellent deal with 2 meals: the first when we arrived called"breakfast" was a delightful mixture of sort of toast, actually warmed bread with jam and honey both on the same piece ( the kids thought it was wonderful!) and boiled egg, fried potato, grapes apples and tea. Then there was heaps of play down by the rivers edge with water fights etc, and a sand football pitch where the boys played. Bharat is here in the office with me and he says that the next part, the rafting was the best. He has leg braces but was determined to get into that raft and as he has used crutches and a wheelchair for many years and is now 19, he has very powerful shoulders, so was an instant success on the oars. They took 3 trips of 9 per time up and down a stretch of river between 2 rapids,. Even the tiny ones loved it. The next meal was goat curry, rice, dhal, fried potatoes, vege curry, and papadoms. There was heaps of food for all 27 of us. Also the van driver was excellent both as a driver and with the kids. When he was out on the raft his mobile rang and there he was in the middle of the river,phone in one hand and trying to paddle with the other. These kids always manage to captivate the drivers with their charm and can do attitude to life. Then it was 2 hours back home with a family of very tired and very happy people. All that for 27 people for 200.00 US Dollars Thanks so much to Rick. I hope you are all well. Things are going well here at DHC New Life and all the children are in good health. They all are busy preparing for exams that start this week then they have around a month vacation and all the students can then have a holiday and a rest. This year 5 students have SLC (school Leaving Certificate) which is a national level exam, where around 500,000 student will participate, among them around 4% student will get above 80%. We hope all our students will get above 80% because they all are intelligent and very hardworking. After the SLC they have 3 months vacation. At that time they go to visit their family so they are excited. Bharat has not visited his family for 7 years, so he is most excited. All other children also have 1 month holidays and may also be going to visit family. After the holidays the SLC students leave the Care House, but we need to continue to provide financial support for them so they become part of our extended Family. Those 5 students have really big hopes and dreams: Sarvana Pandey and Ajaya Lama want to become Doctors, Soma Doma want to be a Nurse, Bharat wants to study Social Science, and Shanta wants to study Business Management. We are so excited all our students have these goals and with your continued help and support will do our very best to help them fulfil their ambitions, and they will all continue to work as hard as they possibly can to utilize the opportunities that we all provide. This year we are admitting 5 new children to the Care House. Hira lal Royaka is 7 years old and has paralysis down his left side. He comes from Humla, a very remote part of Nepal and does not understand Nepali very well as they speak a different language in that district. He is very cute and funny. Kumari Gurung she is 10 years old and from Gorkha she is not disabled but comes from an extremely poor family. When she lived in the village she looked after the sheep, cows and other animals because her family did not have the money to send her to school. Pushpa Khadka is 7 years old and from Sangjha which is also a very remote part of Nepal. She has a problem with her leg and her family is really poor. I am looking at 2 other children's applications. They are also from very remote districts and are really needy, so I hope they will be able to come soon too. 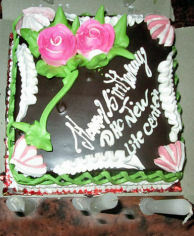 We heartily thank you to all the donors and good wishers who love and support the DHC New Life family. Jackie has sent health money for coming yea on behalf of her friend Gordon which is really great. 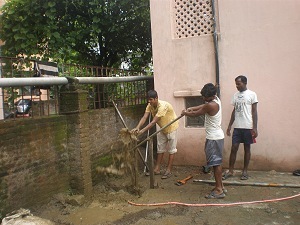 Children of Asia(COA) help to pay the cleaning ladies salary and launched the underground water purification system. Sue's friend has sent us a wonderful donation. Mari Hiribashyi, Jackie Garces , Robert Rose and Sue are all working to fundraise for the education which is really great and important but that is not sufficient for all the expenses because we need to provide high quality private school education for children which is expensive here in Nepal, as well as this year we need to send 5 students on to +2 level Nepal Colleges so we need to support them also. The new school year starts in April and we will be needing to pay the year's school fees and provide school uniforms, text books, etc at this time. If we are able to prepay the school fees tuition fees we get some discount, which is really helpful. For school uniforms, we buy 2 sets of uniforms, 2 sets of footwear and one bag for each student. For coming years our total education expenses estimate is 792700 Nepali Rupees (U.S.$ 9326 and Euro 7,206). Thank you again for you love and support of the DHC New Life Family, without your ongoing help we would not be able to assist these wonderful young people. Three busy months have gone by since the last newsletter. In this time we have had volunteers from France, Ireland and Holland, sharing the daily life of the DHC New Life Family. Shaneo (Ireland) for the donations of new and softer mattresses for all the beds , along with other essentials. Zineb (Holland) for the Water purification machine. Children of Asia Group (France) for the wonderful paint job on the walls of the TV room, and the trip to the Zoo. Louise (Australia) For the lovely handmade blankets for each of the family and even some to spare!. Arthur and Maria for the 1000 Euros donation to the Education Fund. Michael (New Zealand) for Carpet for the bedrooms. In the last two weeks the students have completed their term examinations, and we are all delighted with their results. Sue and Rose were here for several days prior to the exams, and saw just how hard they all study…getting up at 4am to work at their books! A wonderful break after the exams was an educational weekend trip to Lumbini, the birthplace of the Bhudda, thanks to Maiko and Niko for assisting with the costs. We hired a minibus and stayed overnight in Narayanghat, 5 hours travel from Kathmandu.As it is off season the small hotel was happy to make two rooms into Dormitories and the guys and girls enjoyed talking all night. They were so excited. 5am next morning we were on the road again, and arrived at Lumbini 3 hours later in the rain. It is the middle of the Monsoon season here. Amrit and our Driver did a great job of persuading the authorities to give us vehicle access to the internal roads, as the Lumbini site is huge. Even so, we walked for miles, as they all wished to see as much as possible. Later in the afternoon we took a detour to Shanta’s village, (she had not seen her family for 9 months) and they turned on a feast for us all. Then it was another 3 hours back to the Narayanghat hotel for another night. This is rare opportunity for the DHC New Life family and something they just get so much pleasure and enjoyment from…a once in a lifetime experience. When the family celebrate festivals and special events’ music is an integral part of it, but the Care House had no musical instruments. Last week we went to a market and for very little of our money, bought 2 flutes, a recorder, and two drums. The neighbours love us fortunately, as the young people have been playing continually. There will be changes in the Care House Family next year, in that 5 young people will be leaving to begin the next stage of their lives, however they will remain in our extended family and we will continue to have close contact with them. The Organisation will continue to support them in their ongoing education. As you will see, the education costs are ever increasing, and we are determined to keep to the policy of providing the best possible education opportunities, therefore we will be so grateful for any support you can give, no matter how small, as at this time we are trying to build up our Education Fund to meet next year’s expenses. Our Best Regards to you all Amrit, Rose and Sue. I hope you are all well. Things are going well here at DHC New Life and all the children are in good health. They have just finished the winter vacation and restarted school again. Our very exciting news is that we have made a new and comfortable Kitchen thanks to the generous contribution of Christa from Switzerland Then we were able to enclose the Kitchen, and make it weatherproof thanks to the generous contribution of Alycia and Harumi From U.S.A.
Rebika and Sarvana with the Home Tutor. Dahl baht in the new enclosed kitchen. 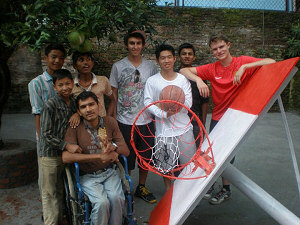 The boys with the three Canadian Volunteers on the completion of the Basketball court. Three volunteers: Jason Chan, Jason Biddell and James Brouk from Canada, with help from the DHC New Life family made a wonderful basketball court. Thanks to Chris of Australia and Molly of Seattle, a library, complete with more books, shelves, tables and chairs has been completed. It is a great place for the children to come together and read and study. Sarvana at hospital health checkup. This month we had the regular health check ups thanks to Gordon and Beth of Seattle's continued assistance with health expenses. Bharat and Shanta had new Orthotics fitted, and Sarvana and Rebika had new eye glasses made All the other family members are well. Thanks also to Jackie and her friend Sue Newman for providing the funds for us to employ a home tutor to assist with homework. The children's second term exam results were wonderful They all secured top ten positions in their classes and got above the 80% mark. Ajaya, Manoj and Sarvana reading in the new library. Homework time with the Home Tutor. Sarvana training with her new orthotics. Mahesh Kuwar was 1st in his class, and Ajaya Lama and Manoj Subedi 2nd in their classes, with Soma Dolma 3rd in her class. These are great results as the standards expected at East-Pole school are high and the competition strong In March the final exams will be held then they have 3 week holidays. 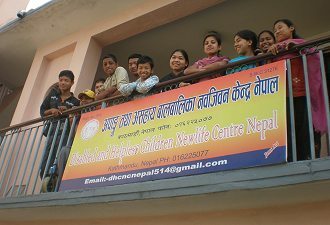 Due to Mari Hiribashyi, Jackie Garces and Robert Rose's initiation some support for DHC New Life education is now being received from the Jolkona Foundation which is really great and important because we need to provide high quality private school education for children which is expensive here in Nepal. The new school year starts in April and we will be needing to pay the year's school fees and provide school uniforms, text book, etc at this time. If we are able to prepay the school fees tuition fees we get some discount, which is really helpful. We currently have Rs 67,000 from Jolkona Foundation and we are thankful to both Sue Driscoll and Dale MacLean who are saving to assist with the new school year budget. We will be grateful for any assistance you may be able to give, no matter how small, towards the continued education of our students. We have now set up a donations account . Bank Name: Nepal Credit and Commerce Bank (NCC Bank) Ltd.
Dear supporters and good wishers of DHC New Life, Namaste. I hope you are all well. Things are going well here at DHC New Lifeand all the children are well. They have settled into the new schoolyear and are working hard. They did very well in their last exams andwe are very proud of them. We have also settled well into our new home. We have a 5 year leasewhich is likely to be extended after that so we are really feelingvery settled now and have a sense of this being our long term home.There have been a number of problems with the house which we have hadto fix, including putting in water pipes so that we could have aregular supply of water and also putting in an inverter so that wehave a back up supply of electricity which has been very important inthat it means that now the children do not have to study by torch or candles! 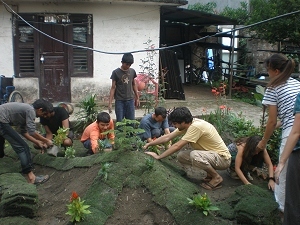 We have also planted a vegetable garden so that we canreduce our food expenses and have good healthy food. As well asputting in a Solar heater for hot water so that we could have regularhot water for sour(bath) for children it is really helpful in winterseason. We have been able to do these things because of the verygenerous support from overseas volunteers and donors. Our next step in making this house a workable and comfortable home isto make the kitchen bigger so that we can all eat together. At themoment the kitchen is a very small room and we cannot fit a table inthere which makes it very difficult for children like Balkumar, DharmaRaj and Samjhana who have problems with their hands and so can’t holdtheir plate in their hand and eat in this way - they really need tosit at a table. Also one of our aims at DHC New Life is to teach the childrenindependence skills like how to cook so that they can look afterthemselves when they eventually move from DHC New Life intoindependent living. At the moment, because the kitchen is so smalland congested when there is more than a couple of people in it, wecannot do this in a way that is safe and so the children are not ableto have these very important cooking lessons. To address this problem and to provide a place where all the childrencan sit and eat together we are wanting to change the kitchen and makeit bigger. To do this we need approximately 1,200 euros (inU.S.$1715 approx) . If you can help with even a little bit of money towardsthis it would be greatly appreciated. If you do send money please email me and let me knowand also if you would like more information please email me. However while any help towards the kitchen would be great it is notin any way expected as you have all already given us so much supportand we greatly value what you have already given and your continuinginvolvement and contact with us. I have excellent news from the Stupa Hospital, they have agreed to give 35% discount on all treatments for the DHC New Life family. This will be a great help. This week all the children, staff and 6 volunteers from the Children of Asia organisation in France, have been really busy making a garden which you will see in the photos below and in the gallery. This group has also donated the funds for a new underground water supply that has now been connected to the New Care House, so we have no more water problems. We are planning to take all the children to the Stupa Hospital for regular health checkups every 4 months, so that we can keep track of their general health on a regular basis. After each checkup I will let you know the results. 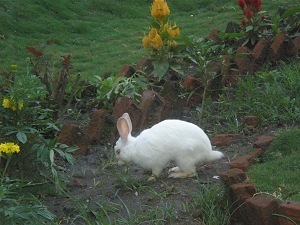 We now have 2 rabbits in our garden and the children love to play with them. So our family is increasing! This is a brief update just to keep you up to date with how things aregoing in our Care House. The children are all well and have settledinto the new school year. Thanks to generous donations from people inAustralia, America , New Zealand,France,Switzerland, Hong Kong etc wehave been able to pay all the school fees for the whole year and buythe children the required new school uniforms and text books. Thechildren did very well in their school results last year with Maheshcoming first in his class! They are very studious. Our very exciting news is that we have moved house. The old house did not have any outdoor area for the children in which they could play orwhere we could have a garden but in the new house we have good outsideareas. I have attached photos so that you can see the new house andthe outdoor areas. Kindness in Action USA has paid the rent for thenew house which is wonderful. We have a 5 year agreement (lease) on this house and while it is much much better than our previous house westill need to fix some things in it like making the toilet moreaccessible, especially for those children whose disability affectstheir legs, put in an underground water storage system as we only getaccess to government water twice a week and work on the garden so thatwe can grow some of our own vegetables. The other good news is that again thanks to Rose Stevens, who is Vicechairperson in Kindness in Action and who visited DHC New Life Centrein February 2011 with Robert Rose, we have an so that we can have electricity. 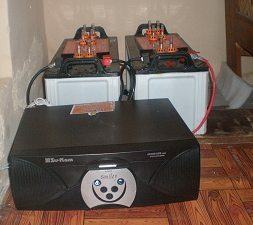 Essentially an inverter it is like a generator which takes batterypower (direct current) and converts it to AC power (alternatingcurrent) which allows us to run appliances or anything needingelectrical power. It's like when you plug in your boom box into yourcar's cigarette lighter socket using that funky plug adaptor (aha! theinverter!) . They come in different sizes depending on what you would be using it for. In Nepal we have 12 hour load shedding every day/night (that means noelectricity for 12 hours out of every 24 hours) which makes it reallydifficult for the children to study at night & to go to the toilet in the dark butbecause we now have an inverterwe have back up electricity whichmakes a big difference for the children - we will be use it to powerthe lights while the children study and do their homework. We have 5 years agreement this house, comparatively more comfortableand has ground , garden but still we need to fixed some infrastructurefor disabled children as well as we need to fixed toilet, we need totake out underground water because government supply water come only 2time in a week, it is not sufficient for drinking. In new house wehave space for garden and play ground but need to fixed it andplantation in garden. We have also had a number of volunteers come and spend time with usand that has been really good - the children love to have volunteerscome! So we are going well and most importantly the children are well andhappy. 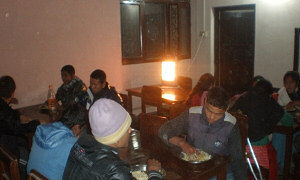 Please if you are coming to Nepal come and visit us and pleasealso keep in touch with us through email. We value our contact withour supporters and thank you very much for all the help you are givingus to help make the lives of the children better. Gordon Reiter has paid the health expanses which is really great! andchildren getting regular health check up 3 times in a year andProsthetics like Crutches Caliper wheelchairs etc.